In advance: Brush pork chops lightly with marinade. Let sit half an hour. You will want the chops at room temperature before cooking. 1. Boil 2½ cups water. 2. Melt butter in heavy bottomed sauce pan. Stir in contents of rice packet and cook, stirring frequently, for two minutes over medium heat. 3. Add ½ cup of white wine and cook 1-2 minutes. 4. Add boiling water and stir one minute. Cover saucepan tightly. Reduce heat to simmer and cook undisturbed for 16 minutes. 5. Remove pork chops from marinade and pat dry before cooking, or they will steam instead of sear. Brush lightly with a very thin layer of canola oil or melted butter. 6. Use your heaviest frying pan and preheat it over med-high heat. Try to keep the pan as hot as you can without causing your oil to burn and smoke. Sear chops for 5-6 minutes on each side for medium. Set aside and cover loosely with foil. Let rest for 5 minutes before serving. This allows the juices to redistribute themselves through the meat. 7. 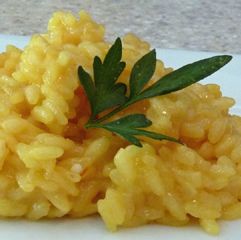 Remove risotto from heat and stir in Parmesan cheese. Cover and let stand for three minutes. This entry was posted in Main Meats, Recipes and tagged pork, risotto, white wine. Bookmark the permalink.